Bus from Cameron to Penang is one of the popular tourist routes connecting two popular tourist attractions in Malaysia. Tourists coming to Malaysia will normally visit Kuala Lumpur, Melaka, Cameron Highlands, and Penang stop by stop. Therefore, direct bus from Cameron to Penang provides convenience to visitors to visit Penang after enjoying the natural scenery and fresh air in Cameron Highlands. 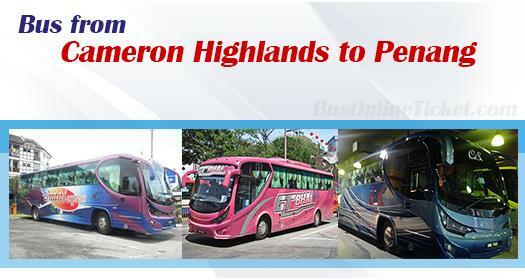 Unititi Express and CS Travel are the only two operators serving bus from Cameron Highlands to Penang. Their fare for the bus from Cameron Highlands to Penang is at RM 32.00 per ticket for Unititi and RM 35.00 per ticket for CS Travel. The price varies slightly with seasons. The duration required for bus from Cameron Highlands to Penang is about 3 hours depending on traffic conditions. A washroom break will be provided upon request to the driver during the journey. There are in total 4 daily departures from Cameron Highlands to Penang. Both express buses depart from Tanah Rata Bus Terminal, as well as additional pick up points from their respective tourist information centres. Their tourist information centres are located at the start of Tanah Rata Main Street. The arrival point in Penang is at Sungai Nibong Bus Terminal. From the terminal, passengers need to take local bus services 401 or taxi to go to Georgetown. The bus stop and taxi stand is just beside Sungai Nibong Bus Terminal. Usually, the bus goes direct from Cameron Highlands to Penang, but sometimes the coach will alight passengers at Ipoh before heading to Penang (Note: From Cameron Highlands to Penang, the bus has to pass by Ipoh). BusOnlineTicket.com is the only one ticketing portal which offers Cameron to Penang bus ticket online booking service with instant confirmation and seat selection feature for bus operators Unititi Express and CS Travel. Because of limited daily trips (morning around 8am-9am and afternoon around 2pm-2.30pm) from Cameron Highlands to Penang, please book your Cameron to Penang bus ticket in advance at BusOnlineTicket.com to avoid disappointment.